Bronzino’s portraits are undoubtedly among his most important works. His most significant examples date from the 1540s onwards, but it was in the 1530s that he began to formulate their prototype. This involved a distant presentation of the sitter, a sense of immutability, and an elegant, stylised appearance. These concepts are already evident in portraits such as the Young Man with a Book of the early 1530s in the Metropolitan Museum of Art, New York, and Portrait of Ugolino Martelli of the end of that decade (Gemäldegalerie, Berlin). Bronzino created a gallery of images of the intellectual society of his day, painting musicians, poets and writers as well as members of the Florentine aristocracy. In 1539 the artist entered the service of Duke Cosimo I de’Medici. 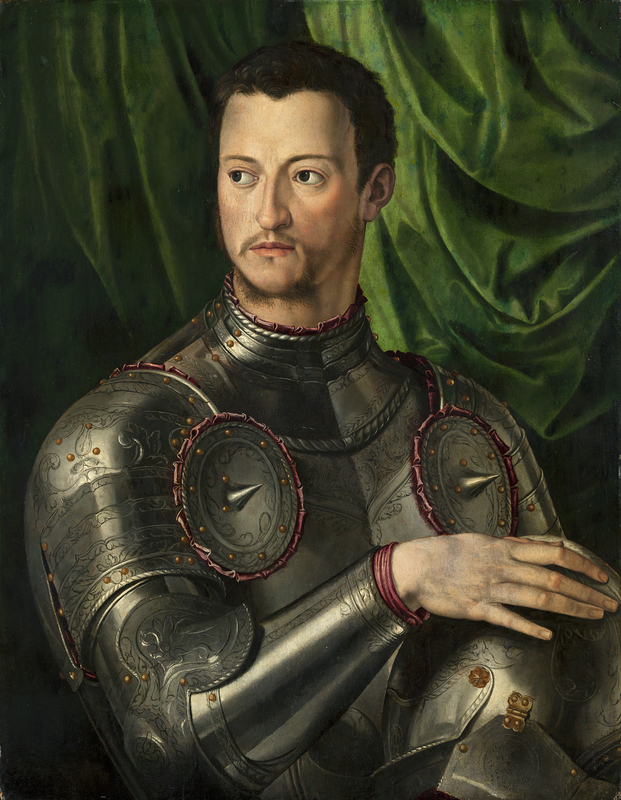 Among works executed for his patron was a series of portraits of members of the Duke’s family. One of his first projects for the Duke was, however, the decoration of a chapel for the Duchess, Eleonora of Toledo, daughter of Pedro de Toledo, Viceroy of Naples. In addition to frescoes of Old Testament scenes he painted an altarpiece of The Lamentation over the dead Christ for the chapel’s altar (Musée des Beaux-Arts, Besançon). This project was followed by another important one that involved the design of a series of cartoons for tapestries of Old Testament scenes together with allegorical and mythological ones. With regard to Bronzino’s activities as court portraitist, numerous examples have survived, both of the Duke and Duchess and their children and members of their court. The portrait of Eleonora with her Son Giovanni de’Medici of 1545 (Galleria degli Uffizi, Florence) is one of the most perfect and exquisite images created by the artist in the entire course of his career. With regard to the portraits of Cosimo, Bronzino was commissioned to create the Duke’s official image which, to judge by the number of copies and replicas that have survived, was used as part of a propagandist strategy on the part of Cosimo. The present panel in the Museo Thyssen-Bornemisza, which was in the Gonzaga collection at an early date, is a version of the painting now in the Uffizi. That work has been identified as the painting mentioned by Vasari, which was probably painted at the Medici villa of Poggio a Caiano in 1545. It was the prototype that was used for around 20 versions and copies, among which is the present panel, considered by Mina Gregori to be a replica, and by Simon to be a studio production. Cosimo is depicted half-length, dressed in armour with his body turned to one side and his brightly-lit head turned in the opposite direction. He places his hand on a helmet that rests on a surface not visible to the viewer. The background consists of a heavy green curtain located in the upper right corner, an element that is not to be seen in the version in the Uffizi which has a plain, dark background. The version in the Art Gallery of New South Wales, Sydney, depicts Cosimo slightly more than half-length with a blue curtain and the helmet resting on a section of column with an inscription. Other versions differ from the present one in details such as the presence of the emblem of the Golden Fleece worn by the Duke or the laurel branch, one of the symbols of the Medici family.